I'm now back down on the floor of the cave, looking up at the sunroof hole. 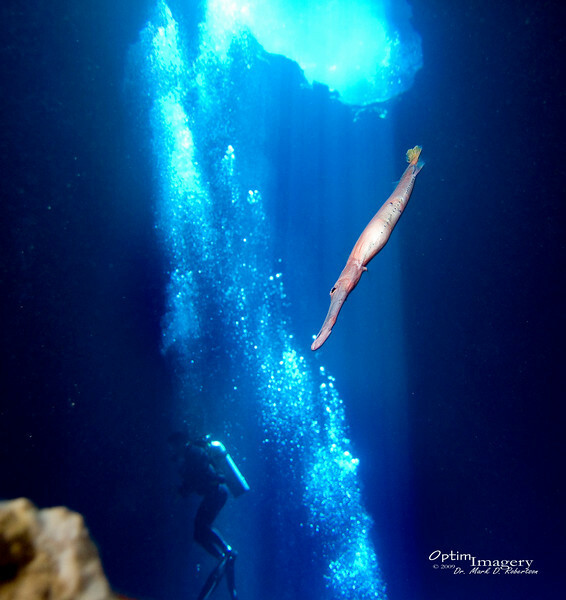 You see a Trumpetfish (Aulostomus chinensis) hovering above. These guys tend to hover, nose down, a few feet to a few inches above the bottom. Then, when they see a tasty-looking little morsel of a fish swimming under them, they dart down and catch dinner. They are, however, usually much more leery of people than is this one. I was afraid that he may be sick or something, but he did later dart away, so I think he just was not afraid. It was fun to be able to see him from this angle.